While planning for vacations and holidays, the ever-daunting task is always choosing the best destination. It is usually an overwhelming process especially if the choices you have are outdoing each other. In the end, you understand you must make a decision so as not to end up at a place your spouse, family, or friends will not feel comfortable at. Also, making the right decision is paramount to everyone enjoying and also avoiding the last-minute rush or even canceling all the same. As for the destinations, some will always stand out in the midst of thousands of them. In this case, you would be interested in looking at Bali and Bora Bora and comparing them. If you have never been to any of them, making the right selection will not be easy. Still, if you have been to either and it blew your mind, it would still be tough to decide whether to go back there or explore the other. In light of that, this post has sought to get you the differences between these travel destinations. The write-up is crucial for any voyager, but the decision-making process will still be yours. Bali is an Indonesian island stretching and covering approximately 5,678 km2. As a tourist destination, Bali boasts of breathtaking beaches, well-forested and volcanic mountains, iconic rice paddies, and coral reefs. With a 2014 national census putting the population at above 4.225 million people, you can never miss the pleasure that comes with interacting with different people from various tribes and enjoying their respective cultures. Bali is home to the beachside city of Kuta that sits on the south end of the island with all-time lively bars. 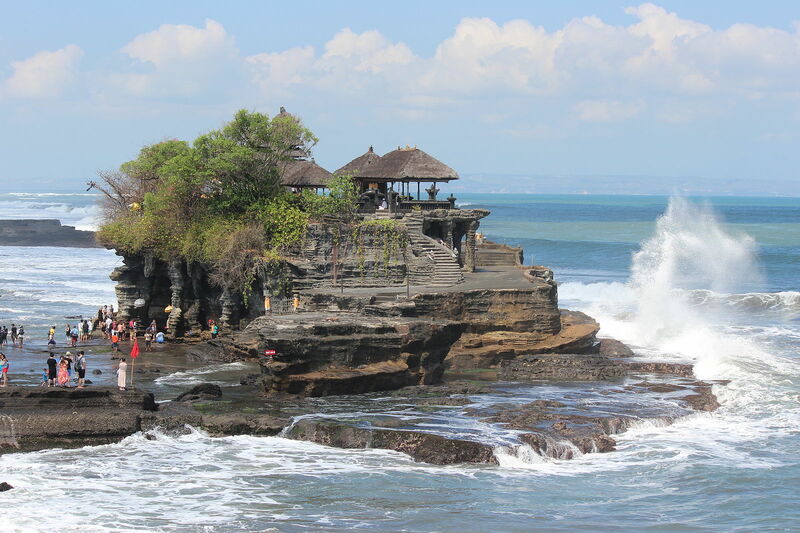 It is houses famous religious sites with the examples of the cliffside Temple of Uluwatu. Also, the island of Bali is famously known for its yoga and meditation retreats as well as the most popular resort towns like Nusa Dua, Seminyak, and Sanur. Bora Bora is an Island in French Polynesia. With French Polynesia financially assisted by France, it is regarded to be an “Overseas Country” and belongs to the Leeward group and a collectivity of France in the Pacific Ocean. Also referred to as Bora-Bora in French or Pora Pora in Tahitian, the island is a tourists’ love. It measures approximately 30.55 km2 or 12 sq mi and is located about 230 km (or 143 miles) northwest of Papeete. Also, the island is surrounded by a barrier reef and lagoon. In addition, the island is home to remnants of an extinct volcano that rises to two peaks of the Otemanu and Pahia mountains, both at the center of the island. As a major tourist destination, it is famous for the aqua-centric luxury resorts it is home to. Bali is a name given to a province in Indonesia. It is also the name of the island in the same area which sits on the westernmost side of the Lesser Sunda Islands. Bora Bora, on the other hand, is an island in French Polynesia, assisted by French financially, and regarded as an “Overseas Country”. It is a part of the overseas collectivity of France. The capital of Bali is Denpasar city. This is the largest city in Bali and is also the main entrance into the island. Bora Bora, on the other hand, is a tiny island. It, therefore, does not have a capital but still has the main town called Vaitape. The town is home to the mayor’s office. The Bali island extends to approximately 5,780 kilometers squared while the Bora Bora island measures approximately 30.55 km2 (approximately 11.80 sq mi) with the highest elevation of 727 m (or 2,385 ft). The main languages spoken in Bali are Indonesian and Balinese. There are several indigenous languages too. As for Bora Bora, the main languages are French and Tahitian although most of the inhabitants have a good comprehension of English. In Bali, the dominant religion is Hinduism while Christianity is the dominant religion in Bora Bora. The population of Bali as of a 2014 census stood at 4.225 million people while Bora Bora had an estimated count of 10,605 people as of 2017. Bali is considered to be relatively cheap while Bora Bora is considered relatively expensive. The administrative boundaries of Bali are made up of eight regencies plus one city. On the other hand, the Bora Bora commune consists of the Bora Bora proper island and its surrounding islets, that is, Motu Tane, Motu Tapu, Motu Ahuna, Motu Tafari, Motu Mute, Sofitel Motu, Toopuaiti, Motu Toopua, Motu Tehotu, Tevairoa, and Motu Pitiaau. While deciding on the destination for your holiday or vacation, many factors come into play. It all boils down to you to choose the winning option and make the moment count. While the destinations might be almost similar in their alluring power, there will always be a way that one pulls you towards it more than the other. As such, it becomes your sole decision to make the right decision that will go well with your spouse, lover, friends, or family. Sarah Brown. 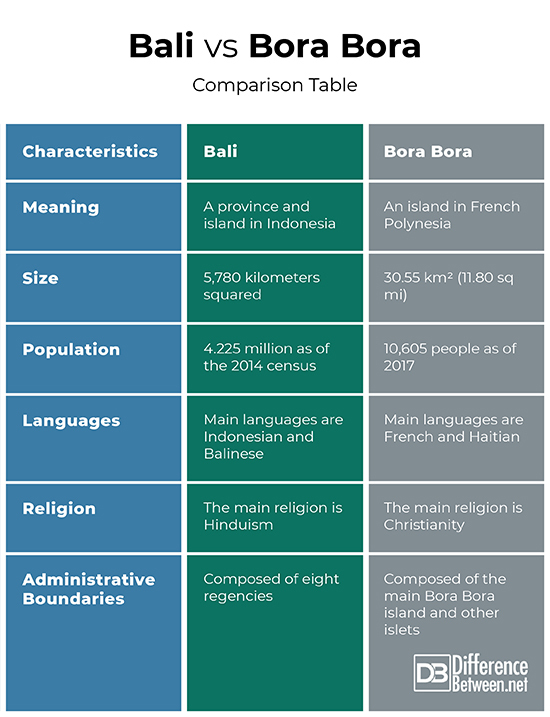 "Difference Between Bali and Bora Bora." DifferenceBetween.net. March 5, 2019 < http://www.differencebetween.net/miscellaneous/politics/difference-between-bali-and-bora-bora/ >. "Maldives Vs Bora Bora, Where Will You Have The Most Unforgettable Vacation?". 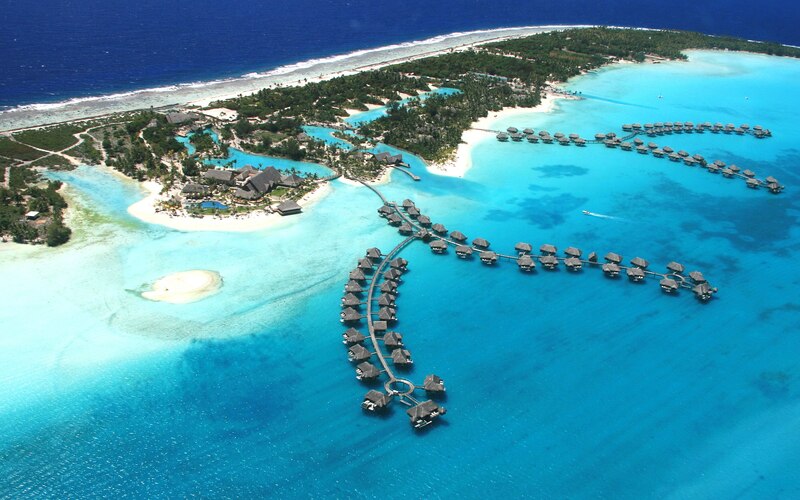 Once In A Lifetime Journey, 2018, https://www.onceinalifetimejourney.com/reviews/hotel-resorts/honeymoon-maldives-bora-bora-2/. Accessed 27 Dec 2018. "Bali Vs. Thailand: Where In Southeast Asia Should You Travel? - Days To Come". Days To Come, 2018, https://www.tourradar.com/days-to-come/bali-vs-thailand/. Accessed 27 Dec 2018. "Bahamas Vs Bora Bora Vs Maldives | Travelibro". Travelibro.Com, 2018, https://travelibro.com/blog/bahamas-vs-bora-bora-vs-maldives. Accessed 27 Dec 2018.